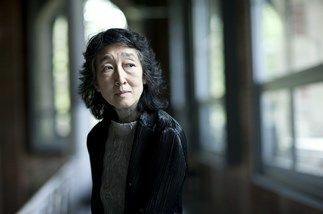 It is hard to believe that the remarkably youthful Dame Mitsuko Uchida’s 70th birthday falls on Thursday 20th December. Earlier this month, she strode swiftly and purposefully onto the platform of London’s Royal Festival Hall to celebrate this milestone event with the first of two all-Schubert recitals. Dressed in signature Issey Miyake black pantaloons, gold shoes and a diaphanous firefly blue jacket, she acknowledged the rapturous applause with a deep yogic bow, her grey flecked shoulder length hair almost touching the ground. Yet there is nothing in the least meretricious or immodest about her performance which is curiously unassuming, rigorously disciplined, and devoted entirely to her art. Along with Bach, Beethoven and Mozart, Schubert is one of Uchida’s “four saints”. “His music”, she writes, “is between life and death. He dreams with his eyes on the far horizon. His music is at once personal and profound. Every note speaks and touches your soul.” What better decision than to play some of Schubert’s most reflective late piano works – his dramatic A minor Sonata D. 784 and his penultimate and great Sonata in A major D. 959, preceded by the Sonata in E flat D. 568. Some years after he composed it, and for musical rather than commercial reasons, Schubert rethought and recast the four-movement E flat Sonata from the key of D flat. The first of those movements, a sunny, songlike Allegro moderato, was executed by Uchida with charm and wit, and the grave Andante molto which followed was played with heart-touching tenderness. Uchida’s account of the Menuetto, pensive in parts and dancelike in others, entirely captured Schubert’s quickly shifting emotional landscape, like refractions of sunlight through a lens. A rippling final Allegro moderato evoked Schubert at his happiest. The contrast with the anguished Sonata in A minor D. 784, composed in 1823, could not have been greater. It was the year in which the 26-year-old Schubert had been diagnosed with the venereal disease that was to kill him. In despair the young composer wrote a poem called Mein Gebet (My Prayer), in which he sought the sweet release of death. The powerful first movement of the Sonata, an Allegro giusto with its urgent Beethovenian introduction, suggests that prayer, and demands from the performer both huge physical strength and lightness of touch. Exercising complete control of the keyboard, Uchida combined power with a silvery deftness. Her exposition of the moody Andante molto was subtle and wonderfully nuanced. The turbulent last movement, marked Allegro vivace and orchestral in scale, is no less than a premonition of death for which the young Schubert had so fervently prayed. At this moment, Uchida’s mastery of the work’s musical texture, and her ability to convey its tragic mood, were unsurpassed. The second half of the recital was devoted to one of Schubert’s finest compositions, the Sonata in A major D. 959, completed a few months before his untimely death in 1828. Joy and dark sorrow permeate this late work. Uchida’s overall vision of the architecture of this demanding piece, coupled with her meticulous technical skill and a deeply intuitive response to the work’s constantly shifting emotions, melded to touch the soul. The spring-like optimism and confidence of the opening Allegro first movement were shattered by an overwhelming sense of sadness in the second movement, an Andantino of tragic beauty. Uchida’s playing summoned a sweet solemnity – punctuated by an unbearable anguish in the movement’s stormy interlude. Some musicologists have questioned Schubert’s mental and emotional stability at this point in the work. The pianist Alfred Brendel described this movement as possessing “a desolate grace, beyond which madness lies”. Sanity is briefly restored in the brightly coloured Scherzo and final Rondo, which Uchida played with consummate delicacy, never forgetting to remind us of the black dog despair lurking just below the surface. After a career of over 40 years, Uchida embarks on her seventh decade as one of the world’s greatest living interpreters of Schubert. Her decision to celebrate her birthday with Schubert and share it with us was both a privilege and a wonderful gift. We wish her many happy returns.